One simple layer of double-woven muslin (gauze). Made of organically grown 100% cotton. Made in Pakistan. ﻿Stock Status: In stock. Usually ships in 24 hours. Pack of 12 wipes, size approximately 9x11 inches. One layer. 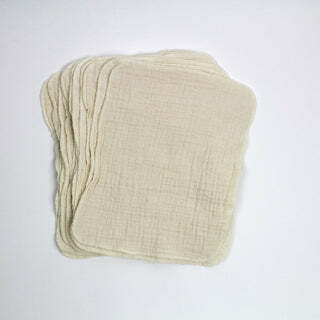 Muslin (gauze) one-layer of double woven organically grown 100% cotton baby wipes. This is the same exact fabric as the Cloth-eez Muslin Flat Diapers. These are 11x12 inches before washing. After washing, the size is approximately 9 x 11 inches. This is a generous size for a baby wipe and you'll probably fold it over to use it to wipe baby. The fabric is thin enough to feel more like what you might be used to if you use disposable wipes sometimes. It is soft organic cotton. Since it is a woven fabric it has enough grip so that it does not smear. The one layer fabric will be wrinkled at the edges after washing. Top load washers will make fewer edge wrinkles than front loaders because of the action of the machine. In theory they could be ironed but I have not tried that and I don't plan to iron them. The edge wrinkles are not a problem for me. It is the normal nature of the soft fabric. You can see them in the picture. Made in Pakistan. See this beautiful fabric as the Muslin Diapers here. Idea: Alternately fold the wipes into each other and slide into a tissue box. They are a nice size for washable tissues. 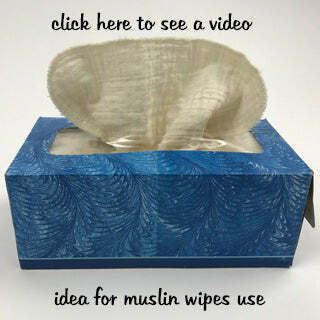 See a video of how to fold them into a tissue box. This idea of folding wipes into a tissue box was fun the first few times I did this, but now I have my pile of these in a less-neat pile and that works just perfectly for me. They are so much nicer to use than paper tissues! Of course, they are fabulous baby wipes, too. They are big enough so only one wipe is likely to be needed and thin enough to handle the details. A great price for lovely OEKO-TEX certified standard 100 fabric that was grown organically. All of our Cloth-eez brand cotton products have the Oeko-Tex certification. Buy genuine Cloth-eez brand with confidence. I use them as napkins! I bought these to use as cloth napkins to minimize use of paper, and I love them! I keep a stack of them on my windowsill and grab a couple for my kids for every meal, and now no more waste! I wash them with whatever I happen to be washing every couple days. Great idea Natalie, thank you! And the muslin newborn flats make ideal dish drying towels too! GMD does a good job to market these for alternative uses such as napkins or tissues or unpaper towels. IMO those are the BEST uses for this wipe. As far as diapering goes I think there are better baby wipes options out there. For a baby wipe these are too large and too thin if I’m being picky. Because there are other options I would go with the Birdseye wipe or the two sided wipe for cleaning baby. I haven’t tried the two sided wipe but it sounds good, and the Birdseye wipe I really like. 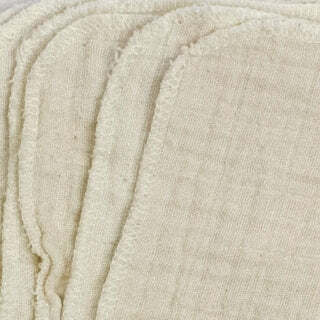 However, if I were reviewing this muslin wipe as an everyday napkin I would say 5 Stars does the job, looks classy on the casual dining table and very adorable for everyday use. We use these for table napkins and hankies. They are the best! Need to order more soon! Soft and durable. I am using these wipes as reusable tissues as my kids go through tons and tons of tissues. They are quite a bit thicker than disposable tissues, but are much more absorbing. They have quilted nicely after several washes. They are not velvet soft, but they are soft enough for us. We decided to cloth diaper before our baby was born, and after reading all the reviews/tips, using cloth wipes seemed like a no-brainer. We purchased one of the kits so we could try a bunch of different ones (highly recommend this!). I can't say there are any in the bunch I don't like - so far they all have made clean-up easy enough. That said, I bought an extra pack of these muslin wipes because I always find myself reaching for them. We made our own diaper solution but only use it when the poop is really sticking. So far, running them under warm water first has worked just fine. This is an extra step, but we make it work and have learned to do that before getting him undressed! My favorite thing about all of the muslin products from GMD, including the diapers on both sizes and these wipes, are how multipurpose they are. We use these for everything, including bath time (no need to get cloths/towels labeled as "baby"), wiping off his face after spitting up, etc. We haven't tried it yet, but I imagine they would be a great replacement for kleenex as well. They are so soft and wash easily, so can be used daily with no hassle. Highly recommend!